Home | Serigraphs and Giclee Fine Art | Muramasa Kudo | Muramasa Kudo Limited Edition Serigraph on Paper: " Sunflowers "
Muramasa Kudo Limited Edition Serigraph on Paper: " Sunflowers "
Image Size: 43" x 32"
About the Art: Muramasa Kudo, a Japanese painter and calligraphy master, was born near Tokyo in 1948 and spent his childhood years in Aomori, a small and very beautiful city in rural northern Japan. From an early age, Kudo was taught love and appreciation for the beauty of nature, and it was this reverence that provided inspiration for his creative desires. Taking First Place in Japan's prestigious Youth Calligraphy competition at the early age of thirteen, in the next two years, Kudo went on to achieve the status of World Class Master in the art of Calligraphy. A world traveler, Kudo settled in L.A. in 1980 where he creates works imbued with a gentle oriental aesthetic. A Zen Philosopher and poet, his masterful subtlety of color coupled with his appreciation for nature result in works of sublime harmony and balance. 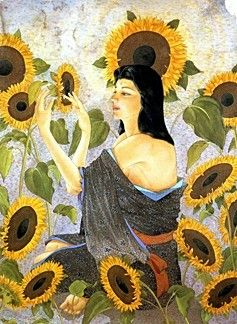 Home | Fine Art Prints & Limited Editions | Gallery Direct Art is your Authorized Chalk & Vermilion Dealer | Muramasa Kudo | Muramasa Kudo Limited Edition Serigraph on Paper: " Sunflowers "